If the launch of NVIDIA’s GeForce GTX 1070 Ti comes as a surprise to you, you’ve clearly been reading different news websites than I have been. This is one of those odd launches where reviewers didn’t even know about the product until it leaked, and didn’t hear about samples… well, at all. The day following the unveil, a card simply showed up. No shipping memo, not even a peep out of NVIDIA. It felt like we received one of the most mysterious GPUs ever. But the GTX 1070 Ti isn’t that mysterious, because it’s been leaked to the point where it already feels like it’s been available. As the name suggests, this card slots in between the GTX 1070 and 1080, and it has a price tag to complement that placement: $449. The timing of this release is also a little interesting, as I’ve been holding off on rebenchmarking our fleet of cards until the Fall Creators Update of Windows 10 released. Furthermore, one of the games just added to the suite, Wolfenstein II: The New Colossus, received optimizations in new drivers earlier this week from both AMD and NVIDIA, so despite being behind, it’s nice to have really fresh numbers to share. 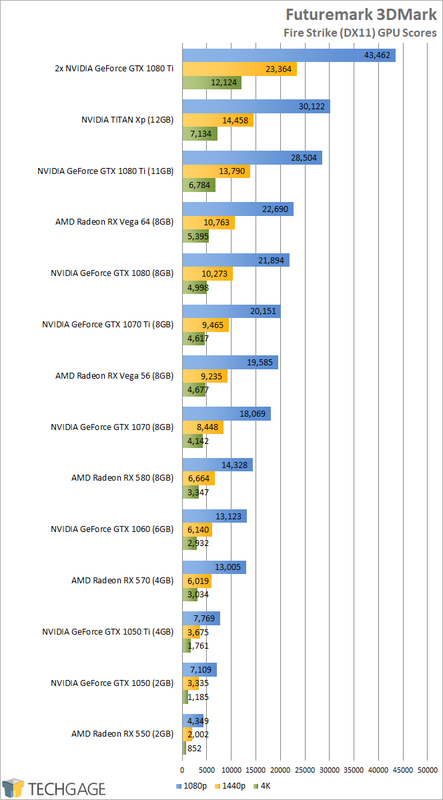 Since earlier this week, I’ve put 14 GPUs or GPU configurations through a gauntlet of synthetic tests, just to get the ball rolling (and get this article out), so for now, you’ll only see results from 3DMark, Unigine, and Catzilla. In the weeks ahead, I’ll be benchmarking the same GPUs across our suite of 9 games (Battlefield 1, Destiny 2, Deus Ex: Mankind Divided, Ghost Recon Wildlands, Rise of the Tomb Raider, Sniper Elite 4, Total War: WARHAMMER II, Watch_Dogs 2, and Wolfenstein II). In a post a couple of weeks ago, I said that the release of a GTX 1070 Ti is a bit strange since there’s not exactly a lot of room in between the GTX 1070 and 1080. That said, maybe that depends on perspective. There’s a 640 CUDA core difference between the 1070 and 1080, which is effectively a GTX 1050 – so there is some room. Fortunately, while NVIDIA could have chopped that 640 down to half, or less than half, the company instead decided to keep the 1070 Ti as close to the GTX 1080 as possible, without truly impeding on its territory (official price difference is $50). At quick glance, it may look like the only difference between the GTX 1070 Ti and 1080 is the 128 CUDA cores that the former lacks. The 1080 does have one other advantage, though, and that’s 10GHz GDDR5X, a bandwidth gain of 25% (vs the 1070 Ti’s 8GHz GDDR5). You can surely overclock the 1070 Ti’s memory to inch a bit closer, but it’s hard to say if it’d overclock that much. Since I haven’t been able to run the 1070 Ti through the entire suite, I can’t state with certainty the values I put in here. I put Overkill on the 1080 for 1080p, and it seems likely the 1070 Ti will match that, given the minor differences, but I’m erring on the side of caution here. As mentioned before, the latest available drivers have been used for testing here, which includes 17.10.3 on the AMD side, and 388.13 on the NVIDIA side. For this review, NVIDIA supplied a 388.09 driver, but since .13 supports the card, I decided to use it instead. There is a single exception, and that’s with the Radeon RX 550 in 3DMark, which used the 17.10.1 driver due to the newer drivers somehow breaking the benchmark. With all of that out-of-the-way, let’s confirm our suspicions about where the GTX 1070 Ti will stand. Who knew? NVIDIA’s GeForce GTX 1070 Ti slots right in between the GTX 1070 and GTX 1080! Comparing those three GPUs further, the GTX 1080 consistently proved 8-8.5% faster than the GTX 1070 Ti, but the GTX 1070 Ti proved 11.5-12% faster than the GTX 1070. If not for the memory clock reduction, I’m thinking that ~12% would’ve become a teenage percentage. AMD’s Radeon RX Vega 56 has proven to be super capable in its fight against the GTX 1070, so it’s no surprise that NVIDIA’s latest $449 card edges past the Vega 56 ever-so-slightly. 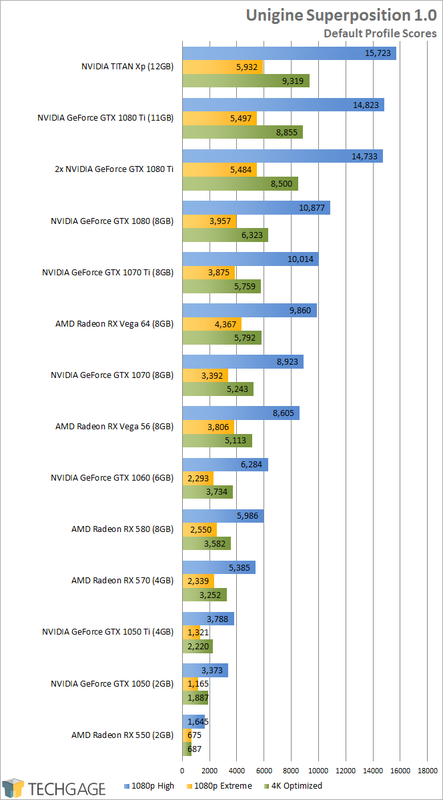 At least in the 1080p and 1440p tests; at 4K, Vega 56 places ahead with a 1% gain. Not that the gains on NVIDIA’s part are much more impressive. These cards effectively deliver equal performance. The situation does actually change a little bit. 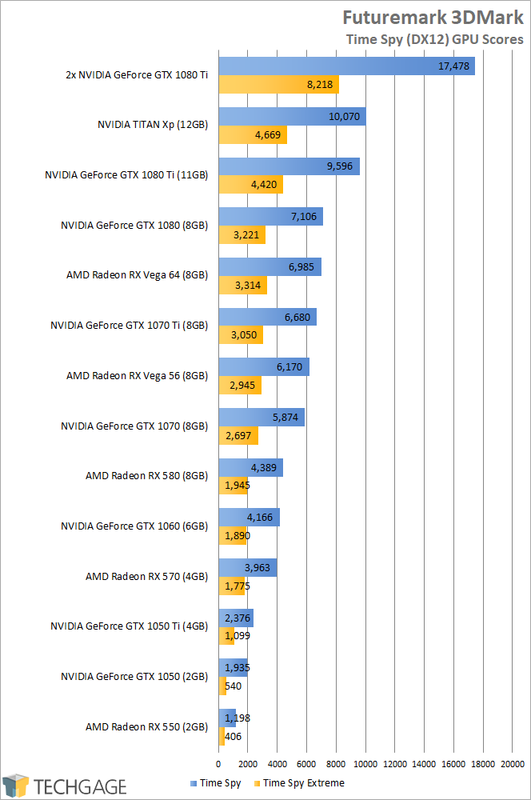 With these tests, the GTX 1070 Ti inches a bit further over the Vega 56 than it did in the DX11 test, but more interesting than that is the fact that the GTX 1080 doesn’t have as much of an advantage over the GTX 1070 Ti as it did before. Here, the GTX 1080 is 5.6-6.3% faster than the GTX 1070 Ti, but the GTX 1070 Ti is 13.1-13.7% ahead of the GTX 1070. On the API side of things, the GTX 1070 Ti performs just about where I’d expect it to in relation to its closest siblings. 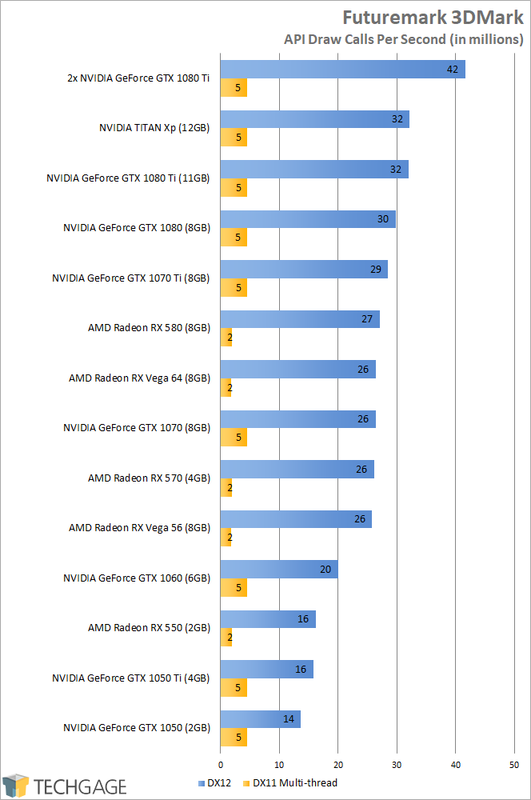 NVIDIA notably places ahead of AMD here, despite the red team’s DX12 prowess, which makes me wish even more I had more benchmarks than just these for this launch article. Blech. Again taking a look at the GTX 1080, 1070 Ti, and 1070, the new Ti card looks even more impressive than before. With the 1080p High test, the 1080 was 8.6% faster than the 1070 Ti, but the 1070 Ti was 12.2% faster than the GTX 1070. For 4K, the percentages were 9.8% and 9.8% (I am making you guess which belongs to which GPU!). At 1080p Extreme, which is far more grueling than even the 4K test, the 1080 was a meager 2.1% better than the 1070 Ti, whereas the out-of-nowhere big brother to the GTX 1070 proves 14.2% better. That’s what you could call significant. Catzilla helps paint a picture of how different benchmarks can give different results based on where they weigh a GPU’s strengths. Unigine’s Superposition doesn’t support multi-GPU, but surprisingly, Catzilla does. This benchmark also proves a bit more punishing than the others on AMD’s RX Vega GPUs, but that’s not the only thing of note. Most of the previous benchmarks have put the GTX 1070 Ti ahead of the GTX 1070 more than the GTX 1080 is ahead of the GTX 1070. Here, the GTX 1080 is 12.6-13.9% faster than the GTX 1070 Ti, whereas the 1070 Ti is 7.8-9.3% ahead of the 1070. What’s this ultimately mean? Given the other results we’ve seen, it feels like the 1070 Ti is a bit starved for memory bandwidth, an obvious side-effect of dropping from the 1080’s 10GHz down to 8GHz. Gauging the capabilities of a card like the GTX 1070 Ti isn’t too hard given it’s the eighth Pascal-based GeForce we’ve taken a look at. We knew it’d probably slot in between the 1080 and 1070, and it does indeed. 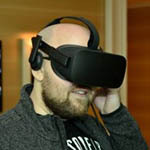 Ultimately, it means that whether you play at 1080p or 1440p, you’re going to be getting a great experience. It’d also perform well in the ultrawide resolution of 3440×1440, and it’d be alright for 4K. 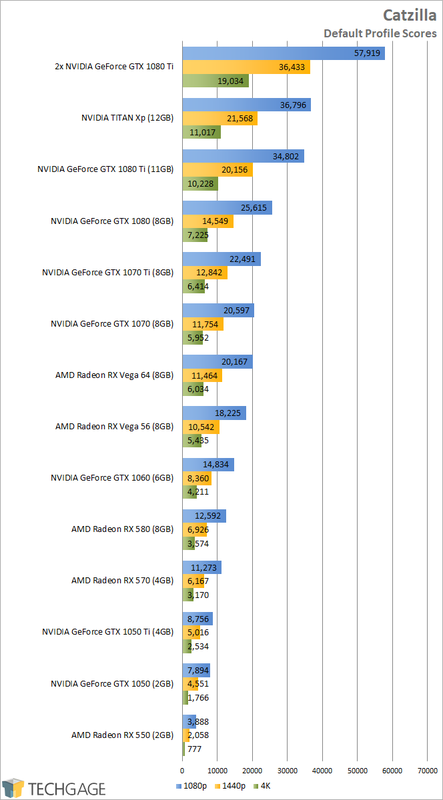 Since I am about to undertake benchmarking every GPU listed in the results above through 9 games, I’m going to clear through the middle-of-the-pack first, and then give a better look at the overall performance of the 1070 Ti in the week ahead (power and temperature information will also be present). A card like this barely needs to tackle the full onslaught of tests given we know so much about it, but benchmarking is really good for finding things we don’t know about. A great example is with Catzilla above, where the performance of the GTX 1080 and 1070 Ti in comparison to all of the others shows that sometimes, memory is important. There’s a big difference between 8GHz and 10GHz, so I’d encourage anyone picking up a 1070 Ti to open their minds to overclocking at least the memory. On the topic of overclocking, NVIDIA says overclocking this card should prove fun, to the point where it seems like the company wants you to overclock it (a testament to its stability, perhaps). The company says the 1070 Ti Founders Edition is equipped with the same 5-phase dual-FET seen in the GTX 1080 FE, and seeing as the cooler on this 180W card is designed for 250W GPUs, it shouldn’t impede your quest for a good overclock. With this timing, NVIDIA is aiming straight at those who own a card like the GTX 970, which came out over three-years-ago (yes, really). That card offered peak performance of 3.5 TFLOPS, while this GTX 1070 Ti is at least double. There is a bit of a price disparity, however, as the 970 launched at $329, and the 1070 Ti, at $449. That’s the official price for the Founders Edition, but it’s also the starting point of where board vendors kick things off themselves. That brings us to the question of how the GTX 1070 Ti fares against its competition. In this case, that’s AMD’s Radeon RX Vega 56. Interestingly, all Vega cards seem to have experienced rather sudden price drops since the last time I checked, which generally isn’t a huge surprise, but it is when we’re following a period where RX Vega cards were priced at a premium. Right now, a GIGABYTE RX Vega 56 is priced at $420, down a staggering $100 since October 21. Other models have seen stark drops as well, but not to that degree. What this ultimately means is, it appears right freaking now is the time to buy a new GPU. If you still want team red, you can find reasonably priced cards (finally). I do not feel confident that these prices will last. NVIDIA was very clear about its pricing standpoint, saying that the 1070 Ti’s $449 SRP “will not change”. Fortunately for the company, it can enforce this to some degree, since it’s the one selling the Founders Edition at that price. 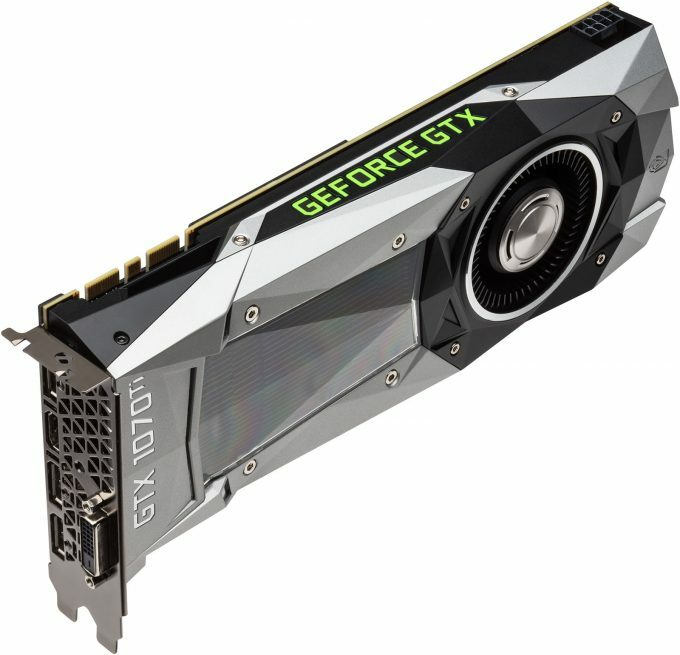 We just need to hope that NVIDIA itself has plenty of stock, or that board vendors do in fact release their own cards starting at $449, because ultimately, the GTX 1070 Ti is a great choice for that asking price. We’ll closely be monitoring etailers the next while to see how prices on all affected cards move. Also, to be clear, this is not our final look at this card. The result of much more thorough testing is yet to come.